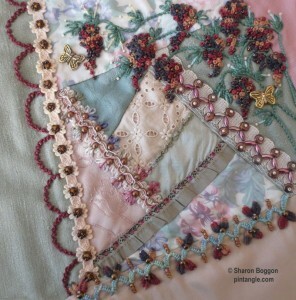 It took me some time but I would like to share another completed crazy quilt block for my lace quilt. If you click on the block you will see a larger version of the photo. I thought I would share a few of the details as I know people like the eye candy. 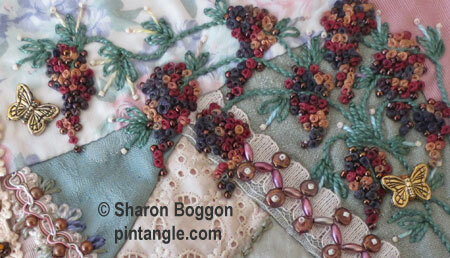 This vine is made of french knots worked in a stranded cotton floss. The vintage lace trim was covered with beads. I have two online classes that are currently available. Follow the links for further details, a requirements list and to book a place. If you are not sure how an online class runs visit this page for a description of how classes are run online. WIP Wednesday is such a good thing for me. Here is a link to my latest ‘champagne’ block. Beautiful block! The beading looks especially lovely with the seam treatments you chose. Congrats! 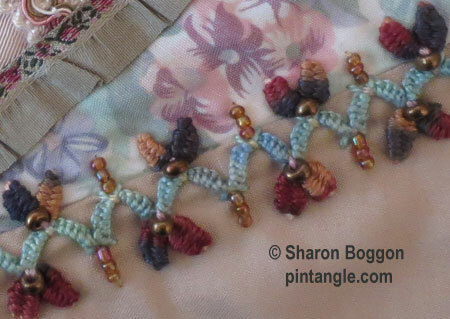 The French knots look very nice together with beads. Another gorgeous block, thanks for sharing the details. I like the combo of beaded Hedebo and woven detached chain. Your vines with grapes are gorgeous. I haven’t tried the woven detached chain stitches yet, but I will on my crazy fall quilt. i like the colour balance in this.